It’s Party Time. Party Marty. Marty Gras! Four years ago, I was the life of the party, doing shots, wearing beads and showing my buzzed smile. Today, I look forward to Friday at 4:30pm and a couple of gin and tonics to calm myself at the end of the tough week. Part of it is age. Four years can add some downtime. Part of it is I’m too stressed. Part of it is too many demands on my time from others. And of course, part of it is me wasting my own time. Who’s ready to party today? Oh wait… it’s Tuesday. I’m at work. And working late. Give me a few hours and I’ll start the party later. Happy Fat Tuesday. Make it a good one. I covet your Marty Gras hat. 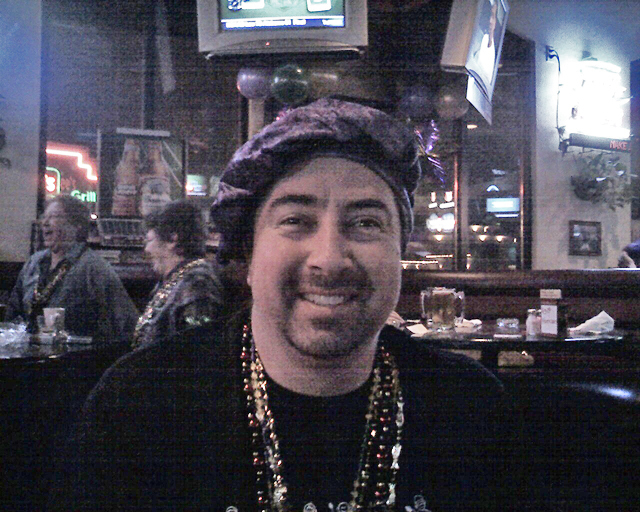 That hat was a nice freebie at the bar that night. I might still have it somewhere. Woohooo! Hopefully I’ll join you a little later tonight! I am so exhausted that all I did to celebrate was eat Paczki. I ate a lot though, so that has to count for something right? What a great picture of you! Thanks for the comment on the picture.